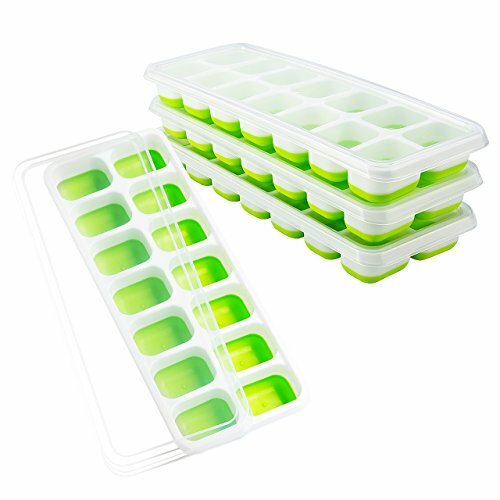 Each ice cube tray features 14-cube and a smart removable lid, which help you make nice-sized cubes easily. Just fill the trays with water/fruits/ ice cream/soda/wine, cover the lid and then put them into the freezer. Since it is dishwasher safe, you could just put them into your dishwasher after use. Made of PP and TPE (silicone) material is safety and durability. With the TPE material made bottom, it is easy to remove the ice cubes. The smart removable lid helps prevent the freezing of excess water and keeps ice cubes from absorbing freezer odors. These easy-release trays could stack easily and securely in the freezer without sticking, saving some space for other items. 1. Do not use metal brush to clean these ice cube trays. 2. Do not clean the ice cube trays with strong detergent in case they get corroded. 3. Keep these ice cube trays away from fire sources in case they get distorted. 4. Please wipe out the trays with soft cloth. 5. You'd better not add too much water in case the ice and the cover sticking together. 6. After freezing, please give icy tray a twist to loosen the cubes, then place the tray in a large freezer bag and pop each cube out. If you have any questions about this product by OMORC, contact us by completing and submitting the form below. If you are looking for a specif part number, please include it with your message.